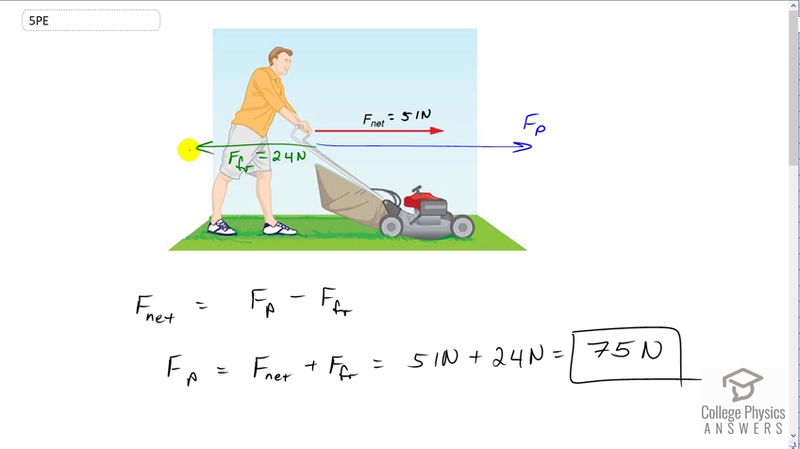 In Figure 4.7, the net external force on the 24-kg mower is stated to be 51 N. If the force of friction opposing the motion is 24 N, what force (in newtons) is the person exerting on the mower? Suppose the mower is moving at 1.5 m/s when the force is removed. How far will the mower go before stopping? Figure 4.5: A person pushing a lawn mower horizontally. This is College Physics Answers with Shaun Dychko. We're told that the net force applied on this lawn mower is 51 Newtons. We're told the friction force going to the left is 24 Newtons. So the force applied by the person, which I've labeled with the letter p for person, is what we're going to find here. We know that the net force is the force of the person to the right positive, then minus the force of friction to the left. We can solve for the force of the person by adding force of friction to both sides and then switching the sides around. So the force of the person is the net force plus the friction force. That's 51 Newtons plus 24 Newtons making 75 Newtons. If the person releases the lawnmower at some point, and suppose that it has a speed of 1.5 meters per second when it's released, how far will it go? Well, at this point the free body diagram will contain only one force and that is the friction force. So, the net force will be the friction force because there are no other forces involved. Then based on knowing that force and knowing the mass of the lawnmower which we're also given, it is 24 kilograms, so let's write down all of our knowns at the beginning of the question. Knowing the force we can figure out what the acceleration is based on also knowing the mass and then knowing that acceleration and its initial speed, we can use the kinematics formulas to figure out how far it will go. So this is the kinematics formula that will help us. We know the final speed is zero because it comes to rest here. The initial position, we'll say that that is zero, so we say x not equal zero and our job is to solve for x then. So we have zero equals v naught squared plus 2a times x and then move this v naught squared to the other side of the equation. Then switch the sides around and you get 2ax equals negative v naught squared and then divide both sides by 2a to get this expression for the displacement of the lawnmower after it has been released. So, we can't plug into that formula though because we don't know what a is. So we'll use our Newton's law here to figure out what the acceleration is. So the net force is the friction force which is pointing to the left, so put a minus in front of it, and net force also is mass times acceleration. So we can equate these two things. We'll divide both sides by m -- well, I guess use the equation and dividing both sides by m. We have ma equals F net, then divide both sides by m and you get acceleration is net force divided by mass and net force is negative of the friction. So that's negative 24 Newtons divided by 24 kilograms which is negative one meter per second squared. So now we return to the kinematics formula and find that the displacement will be the negative of 1.5 meters per second its initial speed, squared, divided by two times negative one meter per second squared acceleration, giving us 1.1 meters.